Making the game of golf faster – and easier – were the reason a whole bunch of new rules were introduced in the first place. And less than three months into that system, there have been some ‘teething’ problems. 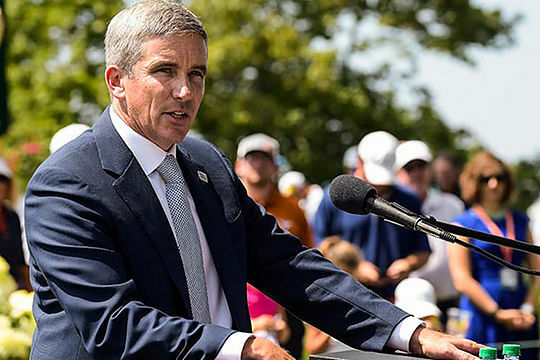 At least US PGA Tour Commissioner Jay Monahan was able to admit that during what has become an annual PGA Tour ‘State of the Tour’ address regarding the state of the game. Monahan admitted there had been a breakdown in the working relationship between all those bodies involved in the workings of the new rules introduced on January 1 this year…namely the R&A, the USGA, the PGA Tour and the European Tour. “There has been a lot of discussion about the rules, and I would like to use this moment to kind of step back and talk about what’s happened over the past six years,” said Monahan. “Lost in some of the discussion is all the things that are working really well, and the list is long, and I think it’s right that we’re two and a half months in and there’s some rules, some existing rules that are causing debate and discussion. “I spent two hours this morning with members of the R&A, the USGA, the LPGA, the European Tour, the PGA of America, Augusta National.